Svelte and ready for action. 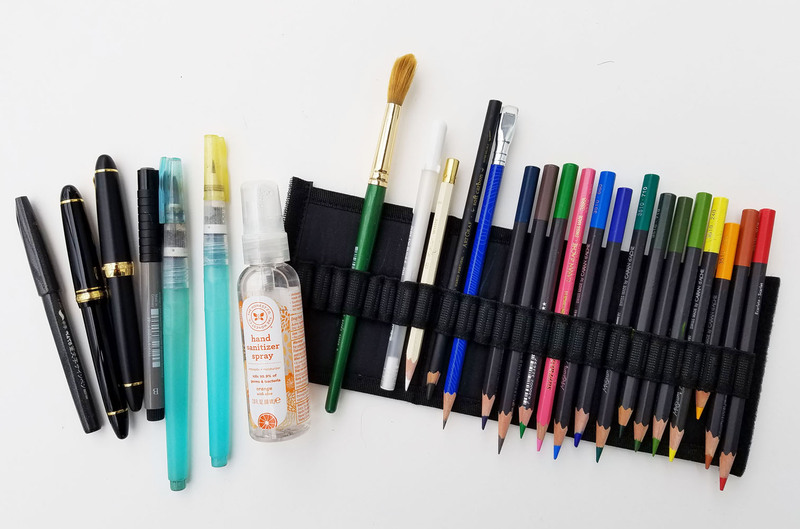 My minimal sketch kit challenge is done, and it taught me many things – not the least of which is that I appreciate a lighter bag, and I don’t need as many colors or tools as I always think I do. I intended the experiment to be temporary – I didn’t want to be colorless forever – but I also didn’t want to simply shove all the stuff I used to carry back into my bag. I dumped every minimal item I’ve been carrying the past two months as well as every item I had taken out before the challenge and laid them all out on my desk. Some things were easy to eliminate because I didn’t miss them at all during the past two months – an extra waterbrush, two brush pens, a second Pitt tonal marker. Of course, some things, like the spray bottle and traditional brush for spreading sprayed water, are used only with water-soluble colored pencils, so without the latter, I had no use for them. With all of that in mind, I evaluated each pencil, pen and brush by asking it this question: Will you earn your keep – enough to make me want to carry you every day? 14 water-soluble colored pencils. Previously, I carried 25. I chose the 14 colors judiciously based on the current season (the pink one for plum and cherry blossoms is overly optimistic, I know, but I need something to hope for) here at home. When I travel this spring and summer, I’m sure I’ll need to change the palette for the locations. But here’s a bonus: I eliminated enough colored pencils that I now have space in my Tran Portfolio Pencil Case for several other implements (with slots to spare!). This compression enabled me to eliminate one of two Lihit Lab Slim Pen Cases I had been using to organize the other implements. The result is a less bulky bag. Not shown: My usual signature of paper in place of the Stillman & Birn sketchbook. It’s easily apparent that once I added color back in, the tools that support it (brushes, sprayer, waterproof ink) also had to be included. But I’m pleased to say that several items proved to be excess, and they didn’t make the cut. With that strict diet, how much weight did my bag lose? 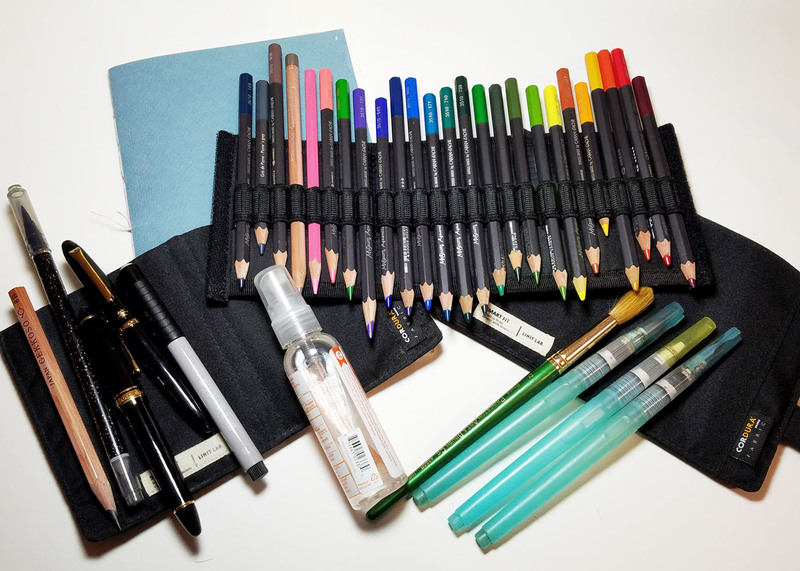 Even with the addition of watercolor pencils, the tools needed to support them, and the two bag organizers (Tran Portfolio and Lihit Lab), my bag weighs only 7 ounces (0.18 kg) more than it did with my minimal kit. A significant factor is the sketchbook itself: A signature of paper (four folded sheets of 140-pound watercolor paper) is much lighter than the softcover Stillman & Birn. As much as I enjoyed using the S&B Nova, that difference in weight is a worthwhile tradeoff. I’m going to continue rolling my own (that’s the same conclusion I came to when I tried the S&B softcover a couple of years ago). Too many cookies over the holidays. 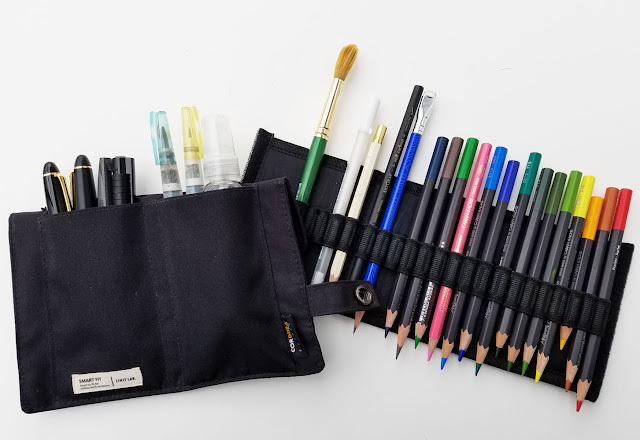 So...it looks like you solved your pen slot problem by eliminating excess equipment instead of finding the perfect single, upright, slotted pencil case (as you wrote about in your 12/30/2017 post -- My Sketch Material Wish List). Nice! But you've changed up your sketch kit so frequently of late that it would be nice to have more specific details of your current kit. What brand(s) and color(s) of colored pencils made the cut, and why? What specific inks are you using? And what specific miscellaneous tools other than colored pencils and fountain pens still remain? Maybe that's too fiddly to ask, but I have found your Current Favorite Art Materials section to be quite helpful. Thanks (whether you give us more details or not). Hi Jean! I'm actually still hoping to get the larger pen slot case... it's being made for me, but it's taking a while. Still, I like the idea of staying slim and light -- I'm afraid that if I get more slots, I'll just fill them up. But it would be nice to lose that Lihit case and just have a single slotted case. I know it looks like I keep changing my kit, but most of the individual items have been the same all along. But you're right that I haven't named them specifically, so I'll work on that post! Thanks for the idea! And I'm happy to hear that you're interested in my kit, which I always enjoy discussing! I love that you're calling it a sketch kit diet. lol Good to see the color back in there. It was interesting to see the weights of the different kits. I know I can get rid of a lot but I'm too lazy to go through everything. I wish I had your dedication.